Nancy grew up on a farm and has been growing fruit, vegetables, and ornamental landscape plants for many years. Plump, red, sweet and flavorful, raspberries are an expensive item on the grocery shelf. But oh, how we love them! This versatile fruit can be baked in pies, frozen for later use, used as a topping for ice cream, cheesecake, and shortcake. You can sprinkle them on cold cereal and even include them in granola. They are a great snack to take to work or on a picnic. Children love them and won't miss having candy if given these delightful berries. 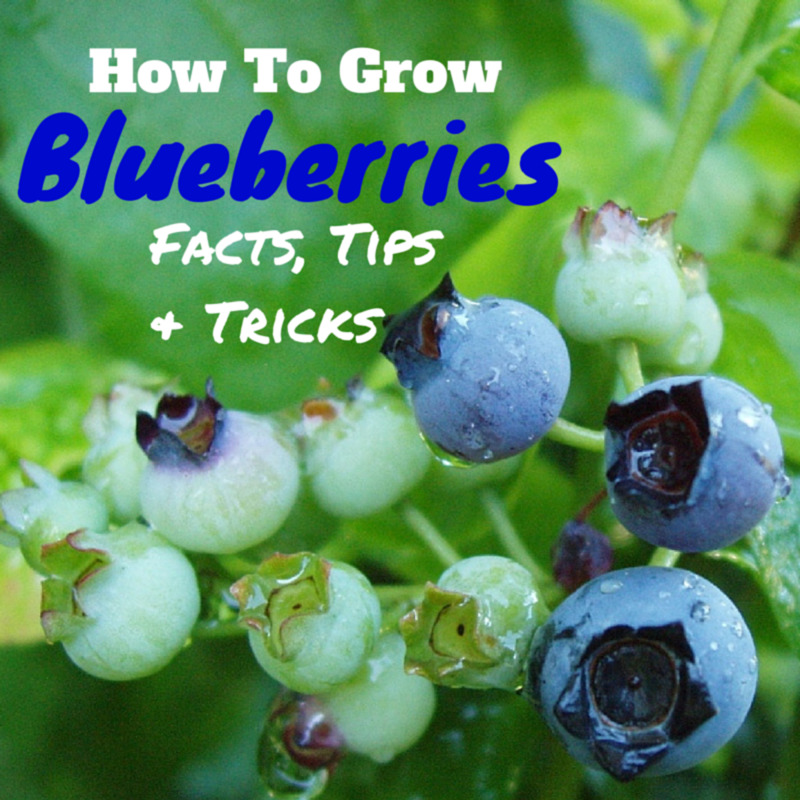 Once started, these berries are easy to grow and very prolific. However, I often hear from neighbors and friends that they tried to grow them, but the canes died soon after transplanting. This Hub will explain how to transplant raspberries to encourage them to thrive in your garden or container. Cane selection is an important part of success in getting the berries off to a good start. You can purchase the canes in nurseries or even at stores that have garden departments. Usually you will find them in very early spring, as these canes do not do well when transplanted in very warm weather. I usually move and transplant mine early in the spring just when the canes are making leaf buds. 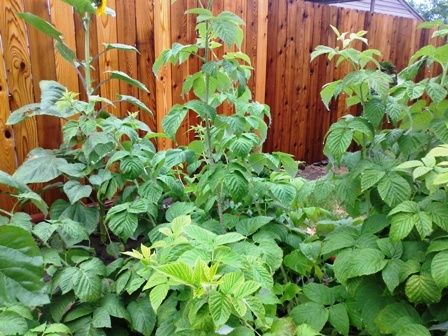 The photo below shows canes about two to three weeks after transplanting. As you can see, they are leafing out nicely. When selecting canes for transplant, I look for small canes that are just beginning to make leaf buds. This way, they seem to have less transplanting shock and I find they are easier to work with having a smaller root base. These plants like to spread their roots outward, and to react poorly to having their roots broken or clipped. Because the plants grow tall very quickly, it is important to take up as much of the root as possible with the cane. These roots do break easily, so I always start digging a foot or two out from the cane. 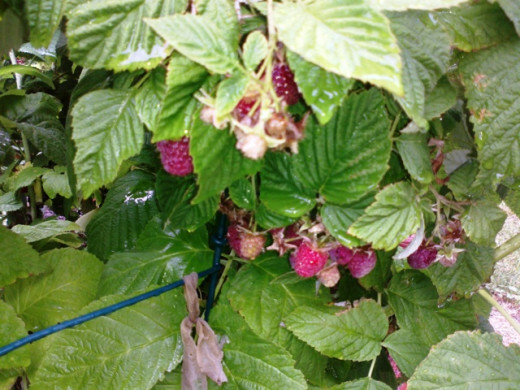 Raspberries will grow in almost any type of soil as long as they have plenty of water. If you have a heavy, sticky clay type of soil you may want to add some sand or peat moss in order to allow the roots to spread more easily. 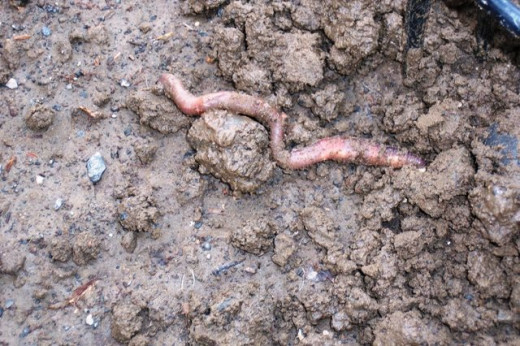 If your soil is sandy, you may want to work in some topsoil or other mulch to help it hold water better during the hot weather. I have also found that they grow particularly well in hot climates if their roots are shaded a bit. The main component is to locate the berries where they will get four to six hours of sun each day, and more if you live in a cooler climate. In desert-like climates, you may need to put them in an area of dappled sunlight, or limit the sun to around four or five hours. Once you have selected a good spot for your climate, it is important to work the soil with a spade or tiller to a depth of eight to ten inches. 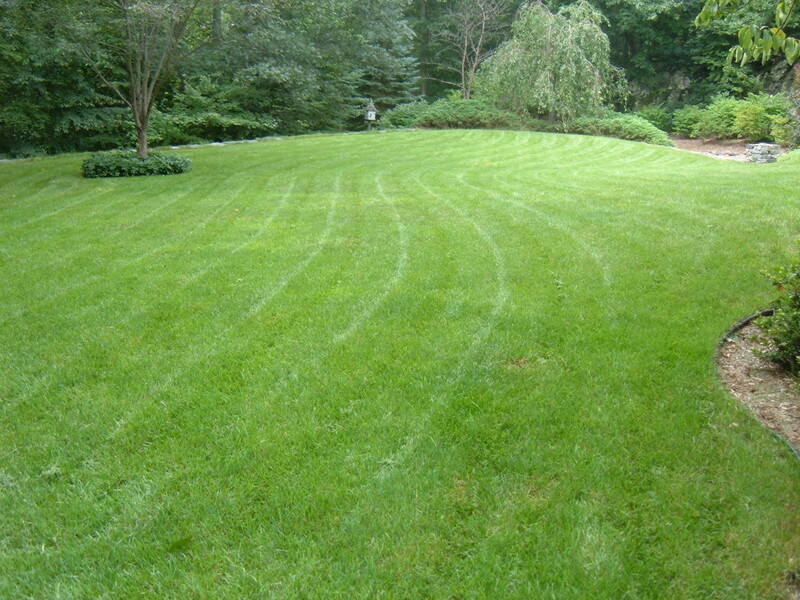 Be sure to remove all sod, grass roots, and weed roots. Doing this gives your plants access to all the nutrients in the soil because they do not have to compete with the weeds for water and other vital nutrients. After the soil has been worked, scoop out an area that will be large enough to accommodate the cane's roots. This will vary depending on the size of the cane. Dig down only about six inches or so. Do this before digging up the cane. Now it is time to uproot the cane you will transplant. Using a shovel or spade, gently dig down into the dirt staying a foot or more out from the base of the cane. Loosen the soil all around the cane before trying to work the shovel underneath the base of the cane. This works the best in damp soil. If necessary, water the canes the day before to insure the soil is damp. After working the soil loose all around, gently work the shovel under the plant. Check to see if the plant seems to be tilting or lifting as you do this. When it seems as if you have your shovel well under the plant, grasp the cane near the base and gently lift up. If it does not want to come up easily, use the shovel to dig a little deeper and / or wider. Continue doing this until the cane, along with a good sized root bundle comes out of the dirt. Many times you will be able to lift cane, roots and dirt all in one shovel-full. Doing this helps the plant transfer better, so if you are able, just lift it with your shovel and carry it to the new spot. If you have to take it from a neighbor's yard to your home, it is better to gently put it into a box or bucket to transport it to the new location. Using a wheelbarrow also works well for transporting the canes. 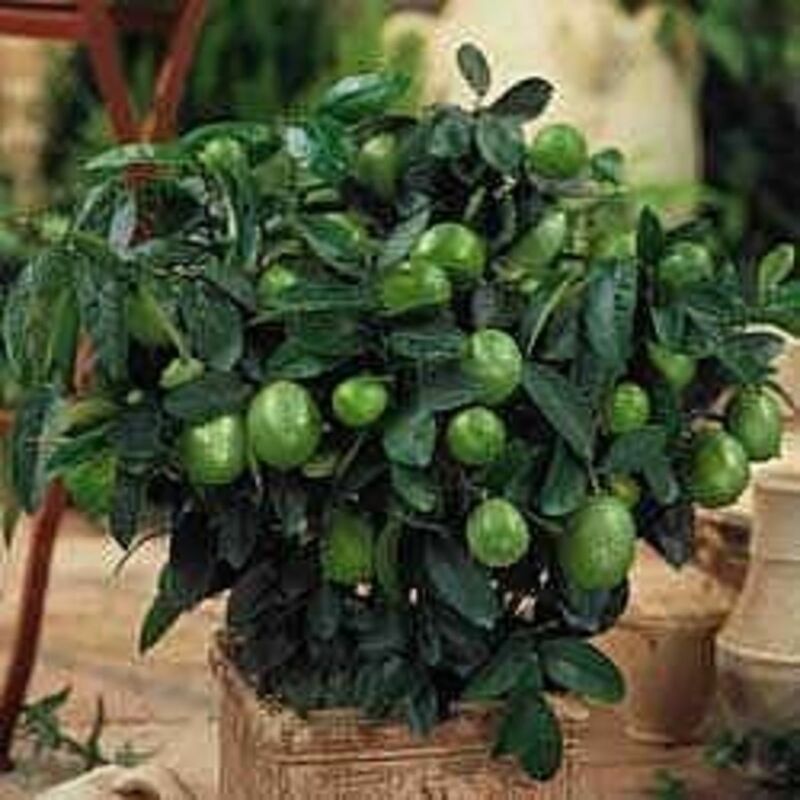 When transplanting from a pot, simply squeeze the bottom of the pot while pulling gently at the base of the cane. The root bundle should come out easily. If not, I usually just cut the plastic planter pot open. Are You a Garden Bug? Don't know. I have never tried it. 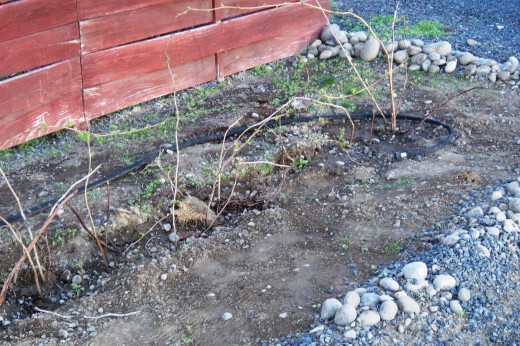 To plant the raspberries in the new spot, lay the root bed gently in the soil depression you created earlier. Try to allow the roots to lay in the same way they were when they came out of the ground. Allow the root bed to spread out a little. Cover the roots thoroughly with soil, pressing firmly enough that the new soil holds the roots in place and the cane remains upright. Cover with about six inches of soil. Make sure that all of the roots are covered. Press down and then water the plant thoroughly. Give the canes plenty of water until they become well-established and are fully leafed out. After the cane has leaves about an inch or so long, you can use a pruning clipper to cut them back to about a foot to two feet in height in order to cause them to bush out. This will also help them to better establish the root base during the first year. Very helpful, Nancy! We have to do this, and this is just the help I was looking for. Thank you for the kind words. I am glad you enjoyed it. Most of my garden knowledge was gained by growing up on a farm and through trial and error. It is a great activity and the produce gained helps the household budget. Raspberries are very costly at the grocery store, but my family loves them. Growing our own is about the only way we can afford them. Well written hub with great and useful information. Voted up. Awesome garden hub! I tried my hand at blueberries last year but didn't do well. I am going to try raspberries. I'm glad to have these tips to set me up for success. Voted up and more, plus pinning!